We eat pizza fairly often for dinner, and while I change up the toppings pretty regularly, I always stick to the same crust. I've just never really felt the need to deviate from my standard pizza crust, but when I saw Annie of Annie's Eats rave abut thin crust pizza, I was sold. I had actually seen this recipe in the previous month's Cook's Illustrated, and while it did catch my eye, I forgot about it soon after reading about it. The nice thing about this pizza crust is that the recipe makes enough for two pizzas. It also calls for the dough to be chilled in the refrigerator anywhere from 24 hours to 3 days. So you can either make one and freeze one, or make one and save the other to make in the next few days. For the first pizza, I made the classic cheese pizza that Annie posted, but for the other, I made white pizza. 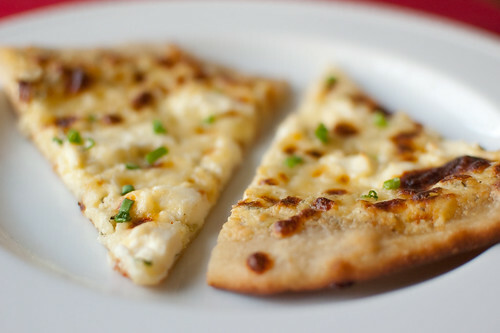 I absolutely love ordering white pizza when we go out for pizza, but I had never made it myself. Now I'm afraid I'll never order it out again; this one was so good that any other version is going to have a hard time living up to it. The sauce is a mixture of ricotta, egg, herbs and spices, and then it is smothered in mozzarella, parmesan, and more ricotta. So incredibly rich and delicious. As far as the dough goes, I was a bit apprehensive when I prepped it, since it was very very sticky and kind of hard to handle. But after the overnight chill, it turns into a smooth and silky dough that is easily rolled and stretched into a perfectly circular pizza crust. Since the dough is prepped so far in advance, this pizza comes together quite quickly. I know there are many other variations of thin-crust pizza I could make, but after this white pizza, it's going to be hard to try anything new. For the dough: In the bowl of a food processor fitted with the metal blade, combine the flour, sugar, and yeast. Pulse to mix well. With the processor running, pour the water through the feed tube. Continue to process until no flour remains and the dough is just combined, about 10 seconds. Allow the dough to rest 10 minutes. Add the oil and salt to the dough and process until a smooth, satiny ball forms that clears the sides of the workbowl, about 30-60 seconds. Turn the dough out onto a lightly oiled work surface, and knead briefly. Pat the dough into a ball and transfer to a a lightly oiled bowl. Cover with plastic wrap and refrigerate at least 24 hours, or up to 3 days. For the sauce: Whisk all the ingredients together in a medium bowl. Set aside. To bake the pizza: Remove the dough from the refrigerator and divide in half. Smooth it into a smooth, tight, bowl, and cover with lightly-oiled plastic wrap. Allow to sit at room temperature for about 1 hour. Return the other half to the refrigerator. Preheat the oven to 500 degrees, and adjust the oven rack to the second-highest position. Place the pizza stone on the rack and heat for at least 30 minutes. Coat the dough with flour and flatten into a 8-inch disk, leaving a 1-inch border around the edges that it slighly thicker than the center. Transfer to a large square of parchment paper that is lightly sprinkled with cornmeal. Lifting the edge, use your knuckles and the back of your hand to pull and stretch the dough into a 13-inch circle, turning the dough a quarter of a turn as you stretch. Use a rolling pin if necessary. Brush the outer edge of the dough with olive oil. 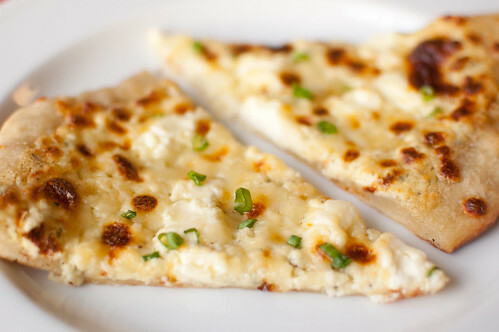 Use a spatula to spread the white sauce over the dough, leaving a 1/4-inch border around the outside. Sprinkle the Pecorino cheese over the white sauce, followed by the mozzarella. Using a 1/2-teaspoon measuring spoon, drop the ricotta over the mozzarella. Transfer the pizza (on the parchment) to the heated pizza stone, and bake 10-12 minutes, or until the cheese is melted, browned, and bubbly, rotating the pizza halfway through. Remove the pizza and sprinkle with the reserved scallions. Allow to cool 5-10 minutes before serving. I've been lacking a bit in inspiration for menu planning lately. It's not that I haven't been cooking, but I've been making old favorites instead of trying out new recipes. Last week I'd had enough, so I started browsing some of my favorite blogs for ideas for my weekly menu. 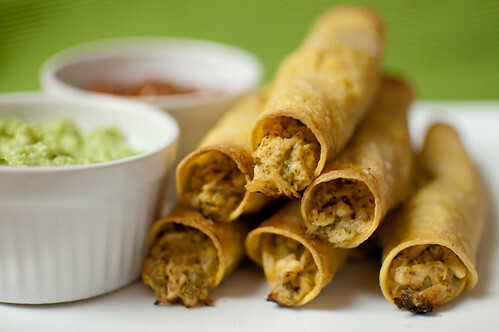 I love any and all Mexican food, so when I saw these taquitos, I immediately added them to my weekly menu. We loved loved loved this dinner. The filling was bright, fresh, and flavorful, and the salt sprinkled on top was a really nice touch. We dipped them into what I call "tomatillo guacamole," which is just mashed avocado mixed with tomatillo salsa. I highly recommend it for these taquitos, as well as just snacking with chips. If you have your chicken cooked and salsa ready, this comes together quite quickly. The filling can be prepped in advance, which would make for an even faster meal. Or, they can be assembled and then frozen for later. 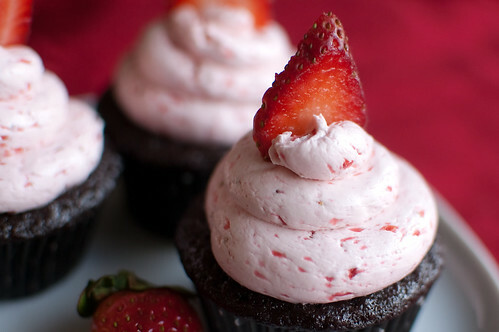 Next time I make these, I definitely plan to make a double batch and freeze half. One of my favorite soups to order out is broccoli-cheddar soup, but since it is usually heavy on the cheese and cream, and light on vegetables, I try to abstain. Therefore, I was excited when I saw this recipe in this month's Cook's Illustrated. 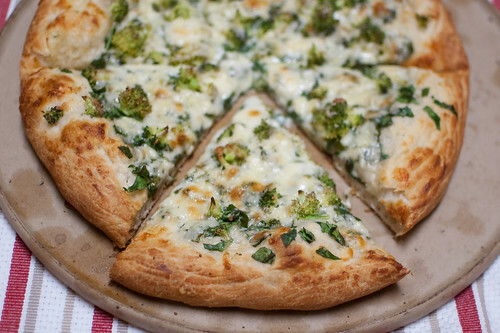 The whole point of this version is to give you lots of vegetable and broccoli flavor, with a hint of cheese. It is heavy on vegetables and light on cheese. 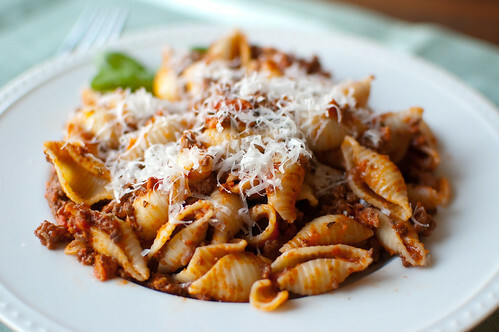 It's reasonably healthy, and quite simple to prepare as well, so it makes it a double winner. When developing this recipe, they wanted to highlight the broccoli. In order to do that and allow the broccoli to be incorporated into every bite, you basically have to cook the beejesus out of it. However, by cooking it for so long, the soup took on an unattractive grayish color. This is remedied by cooking the broccoli with baking soda - it causes it to cook faster while still retaining its bright color. Adding a handful of spinach towards the end of cooking also enhances the green hue. 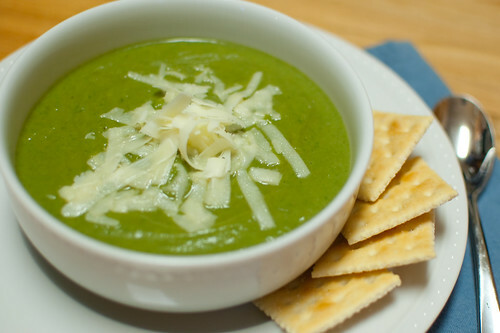 The soup is then pureed with both Parmesan and cheddar, and you are left with a bright green, velvety soup that is full of broccoli flavor. With the weather starting to turn to spring, this soup is a great transition meal - warm and comforting soup with lots of bright and fresh flavor. I served this soup with turkey paninis, and we felt like we were in our own little cafe! Melt the butter in a dutch oven over medium-high heat. Add the broccoli, onion, dry mustard, cayenne, garlic, and 1 teaspoon salt. 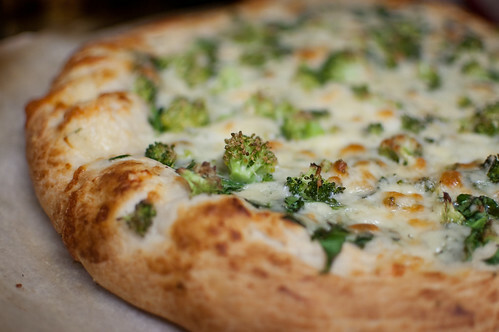 Cook, stirring frequently, until the broccoli and onion are fragrant and slightly softened, about 6 minutes. Add 1 cup of water and baking soda, cover, and cook until the broccoli is very soft, about 20 minutes, stirring periodically. Add the broth and 2 cups of water, and bring to a simmer. Add the spinach, and cook until wilted, about 1-2 minutes. Transfer half the soup to a blender with half the cheese, and puree until smooth, about 1 minute. Transfer the soup to a medium bowl and repeat with the remaining soup. Return all the soup back to the pot, and bring to a light simmer. Thin the soup out with the remaining water if necessary. Season to taste with salt and pepper, and serve with additional cheddar. Even though many people opt to make a fancy, over the top dessert for Valentine's Day (which I love), I usually just make something simple. Joey is a man of simple tastes when it comes to dessert: oreos, chocolate chip cookies/cake, or cheesecake with strawberries. I usually make a heart-shaped cookie cake, but this year I decided to make this ice cream. Joey loves cookie dough, so I knew this would be a hit with him - and of course it was. I love that the base of the ice cream is also cookie dough-flavored, and then bits of cookie dough are mixed in. 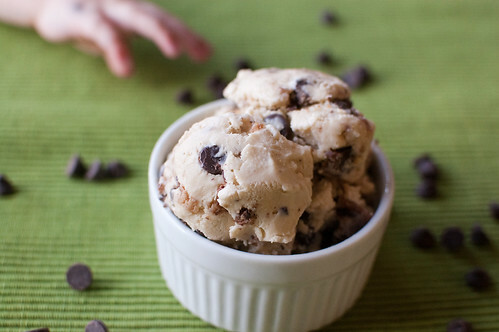 It is a double-whammy, and certainly better than vanilla ice cream with the cookie dough mix-in. This is a pretty standard custard-based ice cream recipe, save for the step of browning the butter with the brown sugar - but that step is what gives the ice cream the characteristic cookie dough flavor. Joey of course loved this ice cream, and I did too. And just because it is still winter, it doesn't mean you can't indulge in ice cream - I firmly believe it is a year-round treat! And look at who snuck into my photo shoot -a certain 2 year old loooves chocolate! To make the cookie dough, stir together the butter and sugar until smooth. Mix in the flour and vanilla, then fold in the chocolate chips. Wrap the mixture in plastic wrap, form into a disk, and refrigerate until firm. To make the ice cream, melt the butter and sugar in a medium saucepan over medium-high heat. Cook, stirring often, until the butter is a deep golden-brown color, being careful not to burn it. Whisk in the heavy cream and heat until simmering. Meanwhile, whisk egg yolks until light and fluffy in a medium bowl. Add a small amount of the cream mixture to the eggs, whisking constantly. Whisk in the rest of the cream slowly. Return the mixture to the saucepan, and cook over medium heat, stirring often, until it has thickened slightly and reads 170-175 degrees on an instant-read thermometer. Remove from heat and pour through a fine-mesh sieve into a medium bowl. Mix in the vanilla, salt, and whole milk. Cover with plastic wrap and chill until very cold. Churn ice cream according to manufacturer's instructions. As it churns, remove the cookie dough from the refrigerator and cut into small pieces. 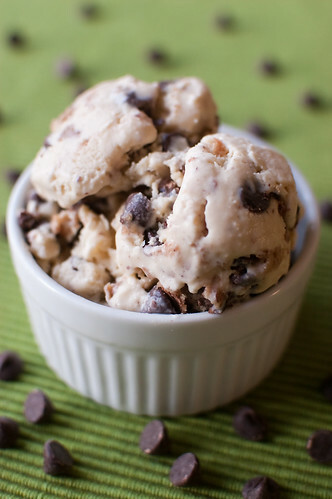 Pour the ice cream into an airtight container and mix in the chocolate chips and the cookie dough. Freeze until firm. If you've been reading my blog for a while, you may remember the anniversary dinner that I posted last May. 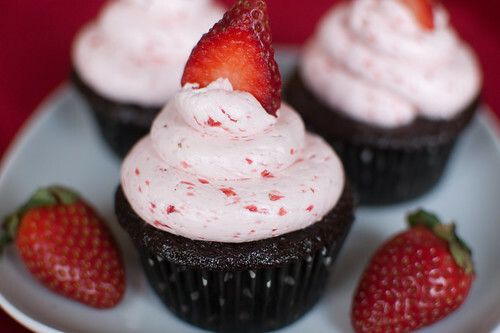 I have shared most of the recipes by now, but I have been saving this one for Valentine's Day. 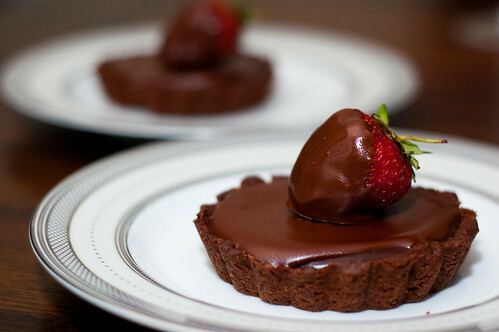 Whenever I want to make a special dessert, my mind always goes to chocolate first. 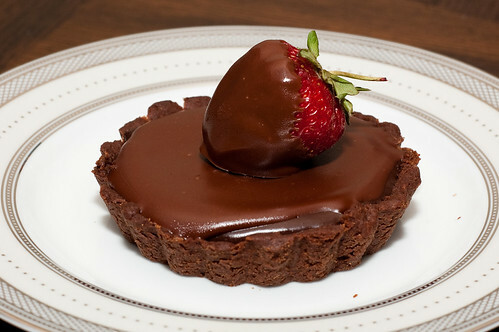 And these tarts are definitely chocolately - a chocolate shortbread crust, filled with chocolate truffle filling, and topped with rich chocolate ganache. If that doesn't scream Valentine's Day then I don't know what does. For a dessert with multiple components, these actually come together pretty easily. The dough is a snap to make in the food processor - the most time consuming step is pressing it into the individual tart pans. 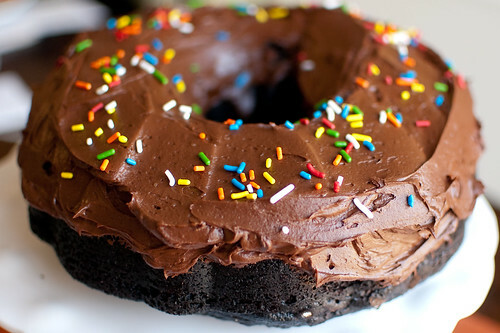 The truffle filling and ganache are also quite simple. And what makes this an even more ideal dessert is that they are assembled ahead of time and then chilled until ready to serve. I just took them out about 20 minutes before we ate dessert to take some of the chill off, and they were perfect. I had quite a bit of leftover ganache, so I used it to make chocolate covered strawberries - which I thought were super cute perched atop each tart. Just a fun, festive touch. Happy Valentine's Day! Preheat the oven to 375 degrees and lightly grease small tart pans with butter. Add the flour, cocoa powder, sugar, and salt to the bowl of a food processor a pulse a few times to combine. Scatter the pieces of butter over the dry ingredients and pulse until the butter is coarsely cut in - some will be the size of oatmeal flakes, while some will be the size of peas. Add the egg yolk to a small measuring cup with a pourable spout, and stir to break it up. Add the egg a little at a time, pulsing after each addition. Once the egg is in, process in long pulses - about 10 seconds each - until the dough, which will look granular to begin with, forms clumps and curds. Just before you reach this stage, the sound of the machine will change, so be ready. Turn the dough out onto a work surface, and very lightly and sparingly knead the dough just to incorporate the dry ingredients. Press the dough into the tart pans, and chill for 30 minutues to 1 hour before baking. Bake the dough 10-20 minutes, until the dough is firm and crisp. Remove the tarts from the oven and decrease the temperature to 350 degrees. For the filling, chop the chocolate into small pieces. Place in a medium bowl and set aside. Combine the sugar, coffee, and butter in a small saucepan and bring to a boil. Pour over the chocolate and leave undisturbed, for 2-3 minutes. Whisk until smooth, then add the eggs, one a time, stirring well after each addition. Divide the filling evenly among the tart shells, and bake 10 minutes. Allow to cool completely. For the ganache, chop the chocolate and place in a medium bowl. Heat the cream over medium heat until gently boiling, and pour over chocolate. Allow to sit undisturbed for 2-3 minutes, then whisk until smooth. Add the butter and whisk to incorporate. Divide evenly among the tarts and smooth the tops with an offset spatula. Refrigerate until ready to serve. One of my favorite things about the weekend is that Joey is home and we can enjoy a nice breakfast together. He usually requests waffles, but sometimes I can convince him to try something new. I've had the idea of doing an egg dish with herbs and goat cheese for a while now, but I couldn't decide on the specifics - should I make an omelet, frittata, or just mix them into some scrambled eggs? 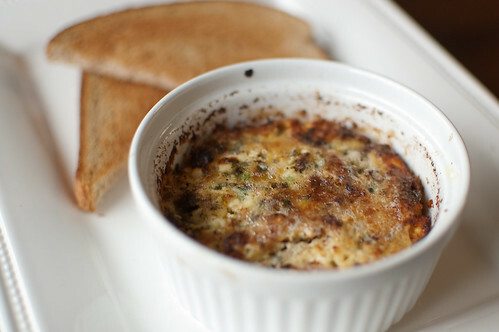 I eventually settled on a simple baked eggs preparation, and I'm so happy with my choice! This elegant breakfast comes together in under 20 minutes. The most time consuming part is chopping the herbs. We both really enjoyed these eggs, though next time I think I'll cook them in a shallower dish. 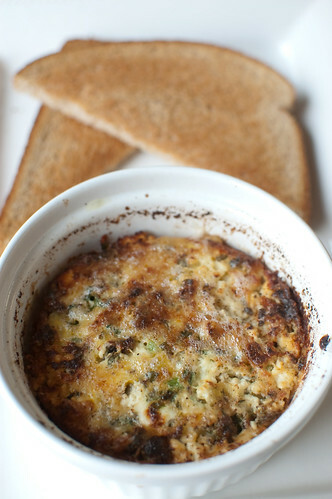 I used ramekins, but I felt like they were a little too deep, and the eggs weren't cooked very evenly. We still really enjoyed this breakfast though - I really loved how the top gets crispy, and I loved the combination of the herbs with the goat cheese. Toast is a must, and bacon and fruit are optional (but highly recommended) sides. Preheat the broiler and adjust the oven rack to be 6 inches from the heating element. Place 2 gratin dishes on a baking sheet. Divide the butter and cream between them, and place under the broiler until hot and bubbly, about 3 minutes. Meanwhile, combine the herbs, garlic, salt and pepper in a small dish. Carefully crack 2 eggs into each of 2 teacups, being careful not to break the yolks. Remove the baking sheet from the oven and quickly but carefully pour the eggs into each of the dishes. Scatter the herb mixture and goat cheese over the eggs, and season well with salt and pepper. Return the baking sheet to the oven, and cook until the whites are just set, 5-6 minutes, rotating the baking sheet to ensure even cooking. Remove from oven and allow to sit about 1-2 minutes before serving. I know they are out there, but I just don't understand people who hate mushrooms. 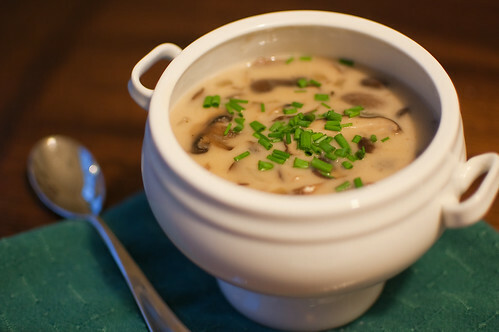 If you've only had canned mushrooms, I can see hating them - they are icky. But a fresh mushroom, sliced and sauteed in butter? There isn't much that is better. Except maybe when you turn them into a creamy, comforting soup. Especially one that is laced with sherry, garlic, and cream. This soup is easy and quick, so it makes an ideal weeknight dinner. Served with a side salad and a loaf of crusty bread, this is a great winter meal that will warm you from the inside out. Melt the butter over medium heat in a large saute pan or dutch oven. Add the onion and cook until soft and transparent, then add the garlic and saute until fragrant, 30 seconds to one minute. Add the mushrooms and cook on medium heat about 10 minutes, until they release their liquid and then reabsorb it. Reduce the heat to low and add the flour, stirring well to incorporate. Gradually pour in the broth, stirring constantly. Add the pepper, nutmeg, lemon, and sherry. Simmer the soup over medium-low heat for 10-15 minutes. Add the cream and stir until the soup is hot. Add the cayenne and season with salt, if needed. Transfer to serving bowls and garnish with the chives. As I mentioned in the Virtual Holiday Party post, one of the biggest benefits of blogging for me is the friendships I've developed along the way. One of these friendships is with the ever-fabulous and famous Annie, of Annie's Eats. She is one of the most talented, smart and funny people I know, and I'm so glad to consider her a friend. I am positively thrilled for her and her sweet family because she is going to have a baby girl in April! Being a mom to a girl myself, I know how much fun they are, how cute (and dangerous) the clothes are, and how incredibly sweet and cuddly they are. In honor of Annie's impending baby girl, Courtney of Cook Like a Champion put together a virtual baby shower for our dear Annie. Of course I was excited to participate - I had so much fun with the virtual holiday party, and I was looking forward to another fun blogger shindig. Since Annie is from the midwest and I'm a southern gal, I wanted to introduce a bit of southern culture to her and the other participants. I really don't think I've ever been to a bridal or baby shower where pimiento cheese wasn't served, so I decided that I would make that my contribution. But this shower is for one of my favorite foodies, so I knew I needed to step it up. For those of you who aren't familiar with pimiento cheese, it is basically a spread for sandwiches that is made up of extra sharp cheddar,diced pimientos (or roasted red peppers), enough cayenne for a small kick, and just enough mayo to bind it all together. I treat it as a condiment and eat it on everything from toasted pita, to grilled cheese sandwiches, as a dip for veggies, to burgers. One of our favorite restaurants in the area is Relish, and the focus is modern southern cuisine. They are quite famous for these pimiento cheese fritters, and whether we go there for lunch or dinner, we always order a plate of them. They are crispy on the outside, and filled with melted, gooey cheese on the inside. Dipped in a sweet-spicy pepper jelly, they are one of the most addictive snacks (or meals) ever. I actually tried to make some fritters a few weeks back when I made fried green tomatoes, but they completely melted into the hot oil and were a massive failure. I did a little research, and actually found the recipe from Relish. The keys to successful fritters are using a combination of cream cheese and mayo for stability, and completely covering the cheese with the panko coating. Once those things are taken care of, they are easy-peasy. It is both exciting and dangerous how easy and delicious these fritters are, and since Relish has sadly closed, at least now I know I can get my fix at home. Both Annie and Courtney have the full round-up of what everyone else contributed to the party. Be sure to check it out - there are so many yummy dishes that it makes me even more sad that we're not throwing a real-life shower! Congratulations, Annie! sidenote: this recipe makes a LOT of fritters. I actually only made 1/4 of the recipe when I made these and ended up with 10 fritters, so adjust the quantities accordingly. Combine the cheddar and pepperjack cheeses in a large bowl. In the bowl of a food processor fitted with the steel blade, add the cream cheese, peppers, Cajun seasoning, mayo, and salt. Puree until smooth, then combine with the cheese. Use a rubber spatula to combine well. Season with additional salt if necessary. Chill at least 2 hours, or overnight. 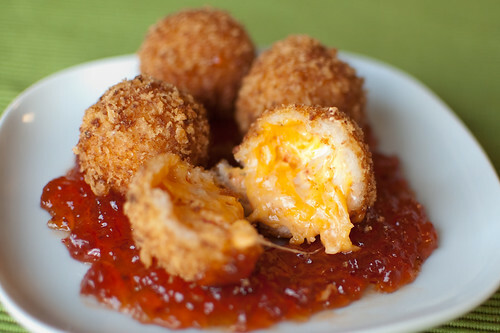 Scoop tablespoon-size portions of the pimiento cheese and roll them into smooth balls. Arrange them in a single layer on a parchment-lined baking sheet. Into 3 separate shallow dishes, add the flour, buttermilk, and panko. Dip each ball first into the flour, shaking off any excess. Next roll in the buttermilk, and finally coat with panko. Repeat the buttermilk and panko, being sure that the entire ball is covered - if any of the cheese is showing, it will leak out while frying. Continue until all the pimiento cheese has been coated. Return to the refrigerator and chill at least 1 hour. Add the oil to a large pot. Place the pot over medium heat until the oil reaches 350 degrees. Fry the pimiento cheese 6-8 fritters at a time, for 3-4 minutes, until they are golden-brown. Remove with a slotted spoon or skimmer and place on a paper towel-lined plate to drain. Continue until all the fritters have been fried. 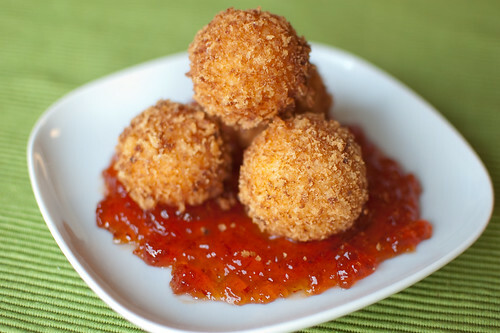 Serve immediately with pepper jelly. This week's Project Pastry Queen recipe is another one of those that I've been wanting to make for quite some time. 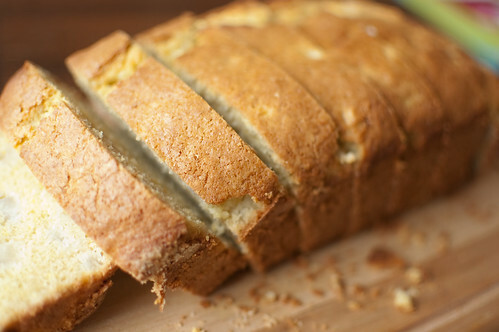 I love the pear-ginger combination, and quick breads are always a nice treat to have around. This bread is studded with fresh pears and ginger, and tastes light and fresh thanks to the addition of both lemon and orange zest. 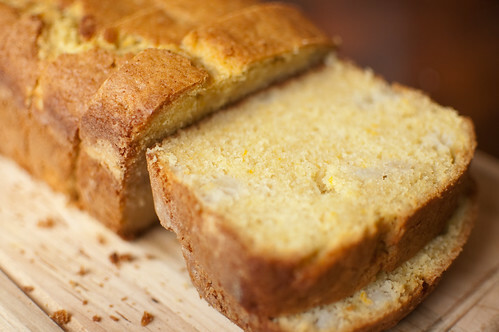 It smelled so good as it baked, and I couldn't stop myself from eating two slices in about five minutes. Simple and straightforward, this bread is in the oven within ten minutes, and in about an hour you'll have a wonderfully sweet, fragrant, and delicious breakfast or snack. Thanks to Aliza of Baker by Night for choosing this yummy recipe. She has the full recipe posted on her blog.